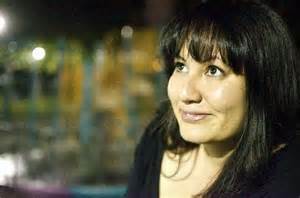 QLD Poetry Festival 2013, is just days away, and one of the many exciting guests about to land in our fine city, is Sachiko Murakami (Canada). Sachiko is well known for her collaborative online projects – Rebuild and Henko – so we are thrilled that she has cooked up a new online project especially for QPF. When I Have The Body Of A Man (WHITBOAM) is a collaborative poem that you are invited to help write. It’s an exquisite corpse with a twist: it steals the form and first line of Elizabeth Bachinsky’s “When I have the Body of a Man”, from The Hottest Summer in Recorded History, (Nightwood Editions, 2013). Let’s call this a formal hijacking of Elizabeth’s poem. In WIHTBOAM, you are invited to contribute a line to a poem, that is prepended by a “When” clause (i.e. ‘When I have the body of a man’). Your line then becomes the leading “When” clause of the next contributor’s line. After adding a line, you may view the whole poem. Or, if you really are too shy to contribute, you may sneakily view the poem here. The collaborative poem WIHTBOAM, created for the 2013 Queensland Poetry Festival, opens on Friday, August 23 at 12 AM Brisbane time and closes on Sunday, August 24 at 11:59 PM. People can play around before then, but the poem OFFICIALLY opens on Friday – all lines added before then will be deleted. So, no matter where you are in the world, be sure to be part of When I Have The Body Of A Man. Projects like this strengthen our global poetry community. WHITBOAM will also form part of the Poetry Unbound workshop with Sachiko Murakami, Friday 23 August, 10.30am. There are a few precious places left in this workshop, so check out the details below! Poetry is a living artform – one that adapts, adjusts, can be renovated, extrapolated. Canadian poet Sachiko Murakami has been doing just that with her online collaborative sites Project Rebuild and Henko. Join Sachiko for a three-hour demonstrative workshop that explores in greater depth the various forms of poetry unbound – collaborative poetry, constructed poetry, found poetry, interactive poetry. Explore further at powellstreethenko.ca and www.projectrebuild.ca. Booking: limited spaces so BOOK ONLINE NOW to secure your place!